The great “Gatsby”. So proud my daughter named him with a nod to literary greatness! Yesterday I took my youngest daughter to the pet store to purchase a pet fish. First, she chose a fishbowl, colorful gravel, and a sad little plastic plant to “furnish” the habitat. It was then time to choose an actual pet. The Betas were stacked in individual cups, each with barely enough space to swim in a circle. There were dozens of them, stacked end-to-end in what looked like a rack for giant test-tubes. To really see each fish, my daughter had to lift every cup out and bring it into the light. She would study the creatures one-by-one and return them gently to the rack, noting the special attributes of each. One had long, flowy, red tail-fins, another was a sapphire blue. One of the fishes was the color and sheen of a pearl. They were all incredibly different, and there were so many! She had to make sure she got the “right” one. “Please pick a fish!” I implored, after what seemed an eternity of her inspecting them. “I’m trying,” she laughed. And I knew she was trying. There were so many fish, and every single one was distinctly beautiful. Every single one needed a home. My girl finally did choose a fish. It was a smaller one, hidden behind the cups of the bolder, fancier ones. 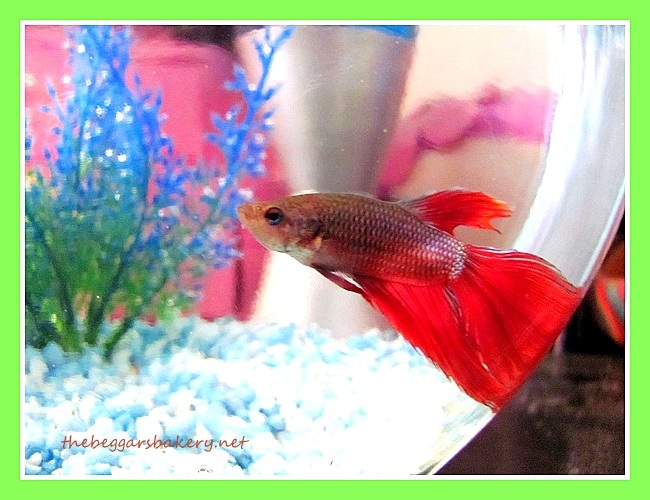 He has nice red fins and perfect, opalescent scales, and he seems happy in his new home with the sad plastic plant. He is a little different from all the rest of the fish, which makes him perfect for our family. In a small way, it reminded me of making a commitment to minister to those in need – because “those in need” encompasses everyone. Many times I get paralyzed by the vastness of the need – people who are suffering from addiction, poverty and other ills -and fail to do anything at all. It begins with the one person, of course. Instead of becoming intimidated by the sheer numbers of people needing care (they are all so different, and there are so many! ), step out for the “one”. Not must telling God, “I’m trying!” but meeting a need and bring it out into the light. Out of the darkness. I think it’s easy to forget the ripple effect of one act of kindness. I know I’ve been touched by someone smiling at me when I’m feeling down and then feel more inclined to pass it on. Just start somewhere. So sweet! Love this! My neighbor just rescued another tiny kitten and I was reading her blog this morning and she too named her kitten The Great Gatsby. Amazing! Starting somewhere is always the key! Hugs! Yes ma’am! And sometimes starting is the hardest part! Hugs back atcha.